New Delhi: The premises of, UEI Global Education- “Le Vitesse 2018” was filled with an energetic crowd of more than 1,000 students from over 9 branches across the country. They had gathered to be part of Le Vitesse 2018, youth festival. The sports and cultural fest was Organized and conducted under the UEI Global Education, The festival saw a melange of the vibrant Indian culture and tradition, where all management students seemed to relive the spirit of ‘unity in diversity’. It’s a second major sports event and cultural festival at a national level. 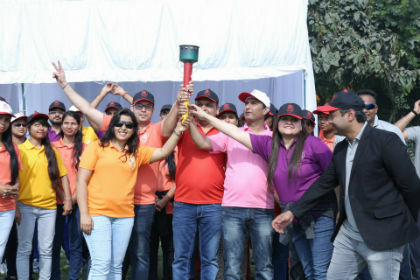 The event marked the participation of around thousand of students from a footfall pan India from across all its 9 institutes located in Agra, Chandigarh, Delhi, Jaipur, Pune, Lucknow, Ludhiana, Jalandhar and Trivandrum. “Le Vitesse 2018”, was the mixture of sports and cultural extravaganza which showcase some of the most alluring performances of dance and music. The three-day youth festival was about 2 days Sports and 1 day Cultural Festival, where total 7 sports were played, including both indoor and outdoor sports such as Cricket, Basketball, Soccer, Volleyball, Chess, Table tennis, Badminton and Athletics, and in the cultural festival a group dance competition, Jam Session and Gala Night was organized to celebrate the cultural vibe of each state and enhance the celebratory flavor of the day. The winning teams and runner-ups was awarded with prize money and medals in each competition of sports and cultural events. Expressing his pride and pleasure in the success of the event, Manish Khanna, CEO, Said – “Such kind of sports events is very important for the students because such kind of programs can only brings the motivation among the players and let them to take their ability forward in the favor of our country, We were glad to showcase on one united platform the varied hues of culture, tradition and heritage to recreate that oneness of Incredible India. We welcome all the students for being the part of “Le Vitesse 2018”.